The classic Hummingbird style acoustic became one of the first acoustic guitars to become a recognized rock and roll icon thanks to Keith Richards, who used a Hummingbird on many Rolling Stones albums in the early ‘70s including Exile on Main Street and Sticky Fingers. Today, the Hummingbird is still a go-to acoustic for rockers like Sheryl Crow and Kid Rock who need an acoustic with fast action and great tone. Now, both beginners and professionals can enjoy a classic look designed and built with the integrity you expect from Epiphone. 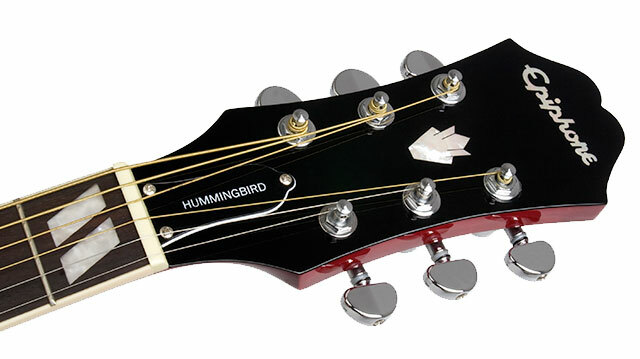 The Hummingbird can cut through an acoustic band and fire up any country rock recording with a sweet, balanced tone. 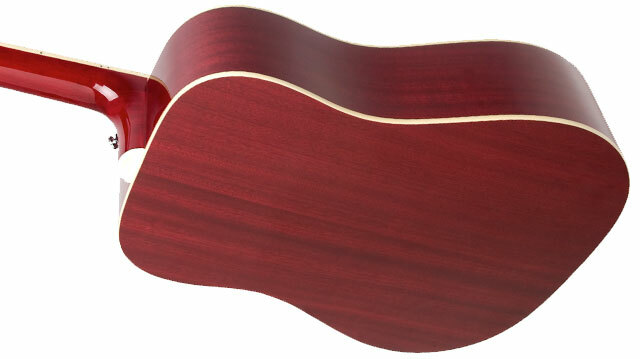 And like all of our Epiphone acoustic guitars, the Hummingbird is also made tough. It goes in tune and stays in tune while the adjustable truss rod and rosewood bridge ensure stable intonation. Thought there are many guitars that claim to be “historic” or “vintage” styled, only an Epiphone comes with a Limited Lifetime Warranty and Gibson 24/7/365 customer service and the experience of a century of guitar making. Start with the best. Visit your Authorized Epiphone Dealer today and get an Epiphone Hummingbird today. The Hummingbird features a Solid Spruce top. Spruce is a rich and complex tonewood that begins to breath and improve with age the more its played. The more you play, the better it sounds! The body is made from solid mahogany and the bridge is made from carved rosewood, a perfect match for the Solid Spruce top.There is a lot of stress put on a guitar between the nut and bridge and rosewood has proven to be both a long lasting and perfect compliment to a Solid Spruce top. The classic Hummingbird/flower tortoise shell style pickguard is easy to spot on stage or across the room. The Hummingbird’s mahogany neck features a 24.75" scale, a SlimTaper™ shape, and a rosewood fingerboard with split parallelogram markers. Our iconic Epiphone Sloped Dovewing headstock completes the look with premium tuners and "Hummingbird" on the adjustable truss rod cover. The Epiphone Hummingbird is available in Heritage Cherry Sunburst (HS).